Killing Rambo, fishing women out of the cut, and debagging Sainsburys, EE and WordPress #narrowboat #england – The Diesel-Electric Elephant Company. Why EE and WordPress? Well, both paid services, between them they are too useless to load photographs to this blog without the most enormous amount of fuss on my part. Too much effort for your spotty thirteen-year-old IT staff to code it to batch drip-feed rather than just go for a gulp and fail, eh? Too much effort for your spotty thirteen-year-old IT staff to actually put some sort of meaningful error message out, rather than “…there has been a error…”? Twonks. Trapped between EE’s now-you-see-it-now-you-don’t mobile service (and, believe me, it’s – very sadly – the best available) and WordPress’s juvenile coding that can’t cope with anything other than fibre-optic connection speeds one does rather tire of constantly clicking “OK” and “upload” for a re-try. Why Sainsbury’s? Well. while it is utterly scrumptiously fantastic that they deliver groceries, when I tick the “deliver in bags” box I do not do so lightly or frivolously. I get fined by Her Majesty’s anti-plastic plastic government 40p for each and every such delivery. I ask for bags because, unlike most housepersons, I am not waiting in my floury pinafore at the kitchen door of some bricks and mortar establishment for my comestibles. I have to load them onto my trolley wherever the delivery van parks and generally wheel them along a length of towpath, before oiking them on-board. So, Sainsbury’s, when I say “with bags” I do not mean “half in – appallingly poorly packed – bags, and the other half of my order loose and slung equally casually into your delivery trays!” I. Mean. Bagged. p.s., Nor do I expect to find, as yesterday, my leaking (Ecover, biodegreable) household cleaning sprays and fluids in amongst my fresh fruit and veg! Fishing women out of the cut? No, I wasn’t using a rod and entirely the wrong bait, I had just got back aboard after collecting the groceries when I heard an almighty splash. Usually such splashing sounds are made by someone’s dog under-estimating the boat-to-towpath distance and trying to leap six yards or more. Modom had fallen off the back of her boat. While modom remained calm and remembered to stand up and begin wading to the side… I found my shoes again and rolled myself along the towpath towards the commotion. 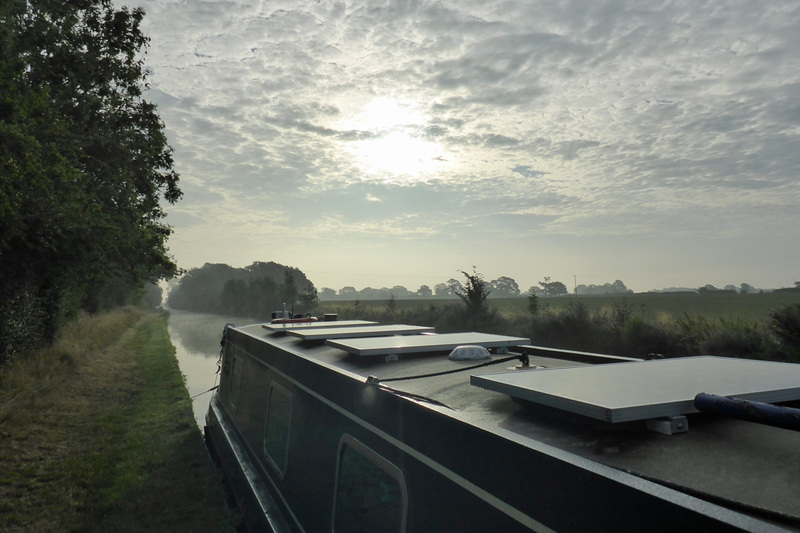 Fortunately, modom was not alone on the boat and someone else was then bringing it into the side in reverse, so we did not have a run-away narrowboat on our hands (millions and millions of people have been killed quite dead over the years by un-crewed, runaway narrowboats). We procured an item of rubber matting to make the armco less of a discomfort to roll up and over, and I lent a quite literal hand and then left them to their embarrassment. Note to self: you really must wear your lifejacket at all times, Hutson, from now on. How much more warning do you need? Well, each evening when I have drained the decanters and can face not another tofu truffle or chickpea fiesta, I seem to be playing host to two, and always two, ruddy houseflies. During the day the flies are easily dispatched with a flick of a cloth, being neither bright nor particularly quick for houseflies, and one of the late-evening two is always as easily dispatched to Housefly Heaven. The other, however, has been the same fly each evening. This is – I hope, one fly looks rather like another to me – Rambo. He is in my spider-poop spotted catching glass, and he stayed there all night. Will he have learned his lesson? I know this because of his behaviour. He’s quicker than most, very quick indeed. He has a radar set-up that detects me some three to four feet earlier on my approach than all of the other flies. Why Rambo? Well, he just won’t die. I’ve injured him grievously. I’ve knocked him senseless (but not been able to locate the body) and a few times I think I’ve delivered the little deuce coup de grâce only for him to re-appear, bandana readjusted, knife at the ready, an hour later. He won’t share my space amicably. If he’d just sit in a corner or watch a DVD or listen to music or read a book or something then there would be no problem, but he won’t. He dive-bombs me, he buzzes me, he lands on my earlobes, he sits on my spectacles (no, madam, I said spectacles) and wherever I am he wants to be, crawling across my laptop screen or sitting on my spoon while I heat up the Heinz Curriedz Beanz and toast my toast for tiffin. Couldn’t bring myself to kill him, so I kept him in gaol overnight and this morning I walked a couple of hundred yards up the towpath, buzzing glass in hand, and released him into the wild. Doubtless he rode quietly on my shoulder back to the boat. I’ll find out, later today, when evening falls. If he does come back then I will show no further mercy. It’ll be a blindfold, one last cigarette and a bullet up the proboscis. It’s all go on the canals, you know. Perhaps instead of a firing squad (firing squads are terribly expensive and involve a lot of paperwork) I’ll stake him out in the mid-day sun? Or over an ants’ nest? Maybe – and here’s sneaky for you, Myffanwy, yes indeed – maybe I ought to just tie him up and leave him on one of the many spider webs that grace the Cardinal inside and out at this time of year, freshly built each day? I wish that he would fly free, but he seems to be the indoor type! I think you need to erect a tiny guillotine for your recurring fly. You only have to behead one and then leave his corpse with detached head for the others to see and they will flee to boats less well managed. ie – ones where humans fall off. Now there’s an idea – I could build one, something the size of a matchbox… anything’s worth a try! Quite lovely photo, that they didn’t *want* to publish. Nahhhh, just do him in. If he returns. Life is too short to spend it, whacking at a fly. Even if it is in love, or lonely, or……. You are being robbed, sir! I pay 5p for my plastic bags from Morrisons (money back on the returns) and can honestly say that they never mix up my comestibles (it’s all colour co-ordinated) although there is some curious practices – a whole bag for one pkt 16x paracetomols I find a bit weird. Spillages and/or one crack egg gets you a refund and to keep the products and occasionally I win because the opperative cannot count and they won’t let me pay even if I phone up and ask! Although 10 wonky avocados is a bit much for one person’s consumption. You are certainly a gentleman, but tights and a cape (even though the pants were on the inside) is a bit much for any package to upload! Just as well really! Splendidly funny stuff! Sainsingbury’s do seem to have a touch of the slap and the dash about their service sometimes. They’re really friendly, but, well, not consistent. I think that I am in some sort of Carry on Canal-Cruising film. Me? Snitch? I’d be drummed out of the Tufty Club!